In the last few days I’ve been surrounded by circles, warped and wefted, beaded and braided cut and pasted, and clipped and edited. Really! This week has been a busy one, preparing some stuff to take and present at the SWAY Art Yarn Guild Festival in Sarasota Florida, coming up in just a few weeks. And there are so many reasons why I am excited about attending this festival! Firstly, it is my absolute honour to be there as the ‘headliner’ for the weekend, two days to teach and share and meet everyone, and finally to be able to put real faces to names, as I know there will be many coming along who I know only through Facebook. What a wonderful opportunity, and I am really looking forward to sharing this weekend with some incredibly creative people. It is also the first ‘outing’ for Arlene Thayer and myself as ‘FiberyGoodness’. We have the Friday evening planned as a Golden Fleece Course get together, along with a special activity we have imagined up for the event. We will also be releasing one of our new courses over the weekend! Both online AND at the festival itself. All I can tell you is it DOES have a fiber kit with it 😉 We will have some goodies and SWAY Swag there on sale, not only the new Course but also some pretty things to decorate your fiber space with that I hope everyone will really love. Is that cagey enough? I know I know! Its all surprises! So back I come to the weaving. I just posted the link to Majacrafts circular loom on my facebook page, because they have recently brought out the large size, which I am planning on warping up tonight to try out another kind of neckwear with the bigger base. What I am finding with these looms, is that since the first inception of them, and the idea of being able to make circular weavings, we have been discovering more and more ways to use them, and more and more things to do with the resulting weavings. 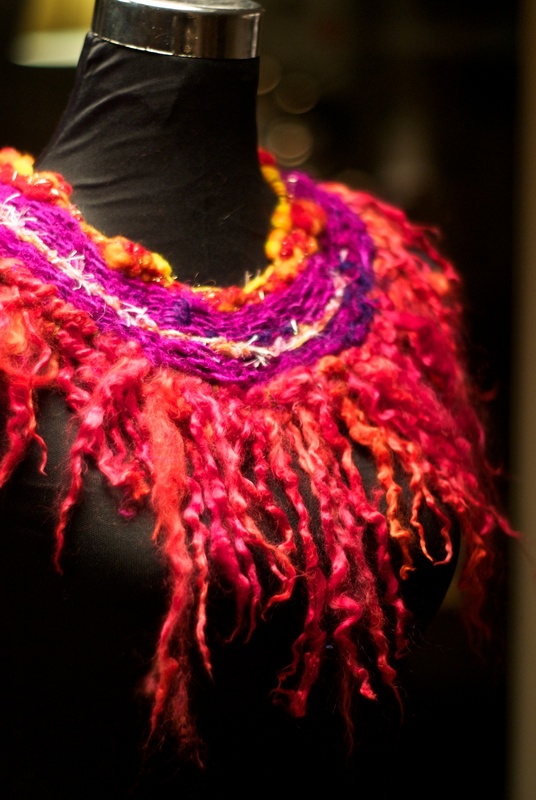 Some people have been making amazing bags, hats, clothing items, even beautiful fibery bowls. 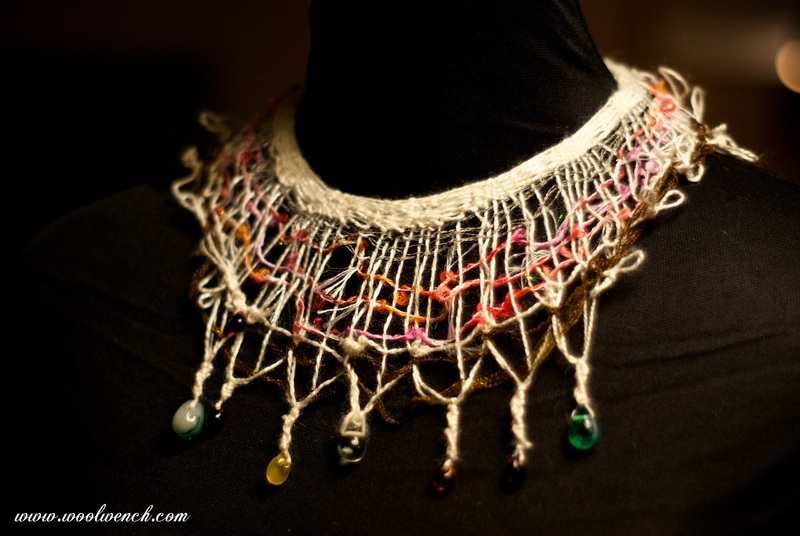 I would love to make enough to crochet them together into a big throw, and I have found several ways to create quite different kinds of neckwear and collars, and I have some more ideas for how I can make some other things using the same method. The circular loom has surpassed my initial expectations and its amazing how the fibery community who have picked these up have been so creative in their uses of both the loom and the end products. 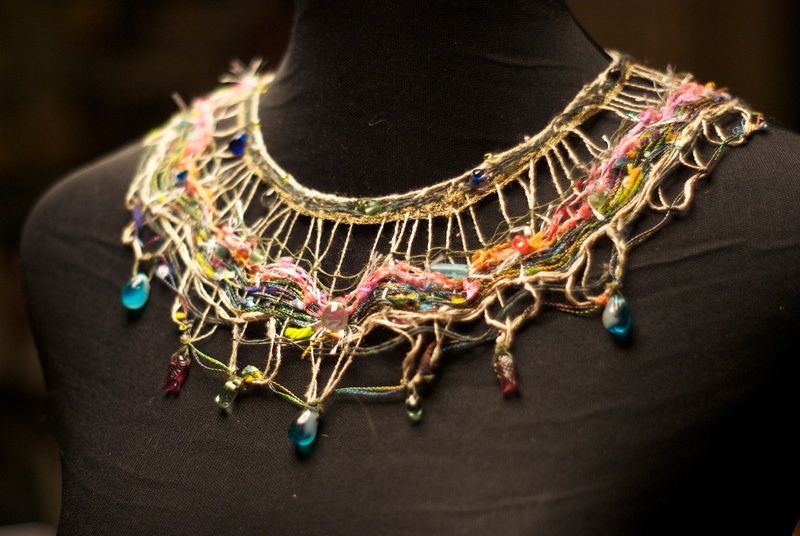 Even the materials people are using to weave have varied from unspun roving to laceweight silks, long locks and art yarns, circles have been beaded, feathered, and sparkled, each weaving turned into a stunning work of art. Our fibery community abounds with creativity and inspiration! Needless to say, I can’t wait to get my new tutorial out there and see what will be created from it, I know for sure there will be plenty more ideas and uses that I haven’t thought of myself! Here is part of my current collection of neckwear pieces, there are a couple more I havent photographed yet, all variations on the theme. Hello! 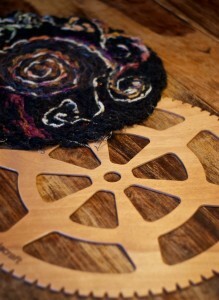 What size Majacraft circular loom do you use for your woven neckwear pattern? It’s a great, versatile concept, but I haven’t been able to find that bit of info. Thanks! the thread in mines is bunching up instead of makiing it bigger what do i do? You used the circular loom to weave those neck collars? What an amazing idea! Please help – my flat circular weaving is curling up and not lying flat..What am I doing wrong? I like that idea of a kind of tribal thing, maybe these are representative of a ‘yarn tribe’ 🙂 I started out with inpsiration from the old Victorian lace collars, and thats how the little mother of pearl buttons ended up in there with the first one I did. That would certainly represent my European heritage! In New Zealand its part of the Maori culture to refer back to lineage and place as part of ones current identity, perhaps that would be a nice direction to take the next piece I make, like a heritage collar or something, with elements of all those things in it. Thanks Susan! Your response is so interesting, thank you for all the details, I really appreciate knowing the inspiration behind the work. The neckwear is absolutely gorgeous! Wish I could attend in FL as I’m sure I would learn a lot. What can l say love all of them, must add circular loom to the list! Some of us don’t have Ipads but have android based devices. Can you make your downloads will work on android devices too? Boy did I make a mistake trying to save a dollar or two when I bought my tablet. I hate missing all this good stuff. at the moment making stuff for Android devices is beyond my skills, however I will keep making everything available as PDFs so they can be viewed on pretty much all devices and also printed out. Yarn Buckles: Cute AND Useful! 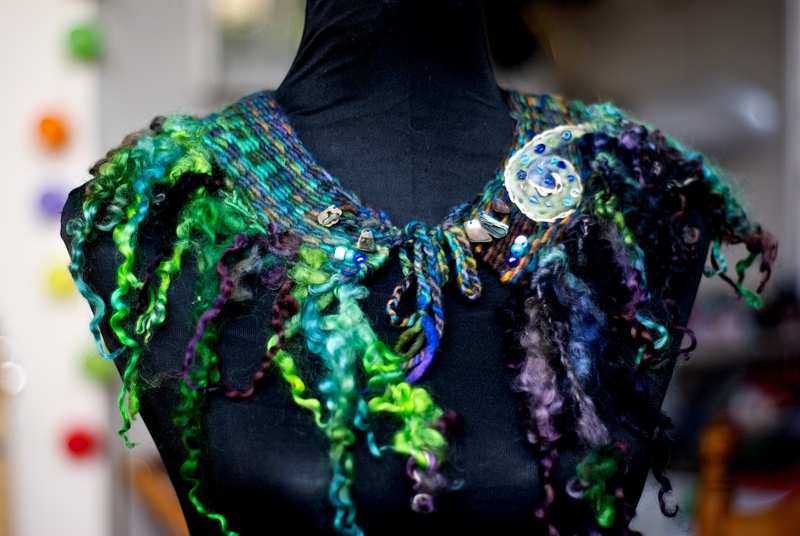 What is ‘Art’ about ‘Art Yarn’? The ups and downs of a creative life.